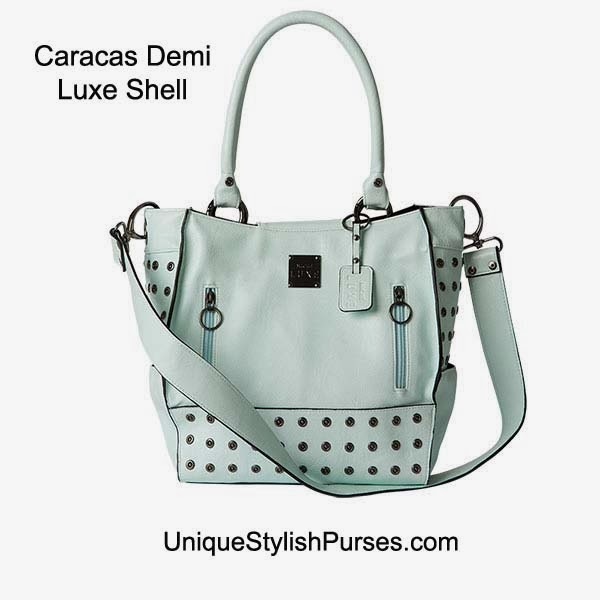 Caracas Luxe for Demi Miche Bags reflects both the color of the landscape of this South American city. Cool mint green is perfectly accentuated on both sides by row upon row of playful rivets. Two small front zippered pockets and gunmetal hardware complete this look. Comes with matching handles, matching shoulder strap, key fob and dustcover. Side pockets; rectangular bottom. Handle length: 17 ¾”; width: ¾”; handle drop: 8 ¼”. Shoulder strap length: 36 ½”; width: 1 ½”; drop: 17 ½”.